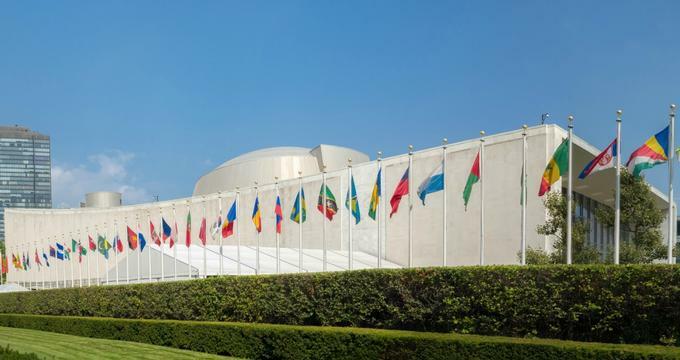 Located within Manhattan, New York City, and operated under an extraterritorial agreement with the United States, the United Nations Headquarters welcomes more than one million annual visitors, offering rotating exhibitions, guided building tours, and a fine dining restaurant. The United Nations is an intergovernmental organization created in the aftermath of World War II for the purposes of creating and maintaining international peace and order. At its founding in October of 1945, the organization contained representatives from 51 member nations. Today, more than 193 nations are part of the United Nations, which serves as the largest and most powerful intergovernmental organization in the world. As an international governing body, the United Nations strives to promote human rights, security, and peace throughout the world, supporting environmental protection initiatives, fostering socioeconomic development, and providing humanitarian aid in the case of natural disasters and armed conflicts. In December of 1945, the United States Congress formally invited the United Nations to house its permanent headquarters within the country. The following December, the decision was made by the UN General Assembly to construct a headquarters in New York City, with an $8.5 million donation by John D. Rockefeller, Jr. securing a site in Manhattan’s Turtle Bay neighborhood overlooking the East River. Early UN offices were housed within Rockefeller Center in 1947 as the headquarters design process began, with more than 50 basic designs created for the project. The project’s design contract was given to Brazilian architect Oscar Niemeyer in 1949, with construction beginning later that year after a formal dedication ceremony and overseen by architectural firm Harrison and Abramovitz. In August of 1950, the complex’s Secretariat Building was opened for business, and in October of 1952, the first meetings were held at the General Assembly Building. Additional facilities were added throughout the 20th century, including the 1961 Dag Hammarskjöld Library and a 1987 building housing the United Nations Children’s Fund (UNICEF) offices. In May of 2008, a $1.9 billion overhaul of the complex was embarked on, with construction lasting five years. Today, the 18-acre United Nations Headquarters are located within Manhattan’s Turtle Bay neighborhood, which is sometimes used metonymously for the United Nations as a whole. Though the headquarters are located within the borough of Manhattan, the complex’s land is operated under the sole administration of the United Nations under an extraterritorial treaty agreement, though most local, state, and federal laws are observed by the agreement. The complex is bordered by Manhattan’s First Avenue, East 42nd Street, and East 48th Street and overlooks the East River, featuring several buildings housing official offices and facilities for the United Nations. Three regional headquarters for the United Nations are also operated in Geneva, Switzerland, Vienna, Austria, and Nairobi, Kenya, with 15 other international offices for specialized agencies within the organization. The complex’s buildings include its Conference Building, which extends 400 feet along the East River waterfront and connects the General Assembly and Secretariat Buildings. The Conference Building houses the Security Council Chamber, designed by Norwegian architect Arnstein Rynning Arneberg and featuring a prominent mural by artist Per Lasson Krohg, which symbolizes the promise of future world peace. The Trusteeship Council Chamber, designed by Danish architect Finn Juhl, is also located within the building, along with the Economic and Social Council Chamber, designed by Swedish architect Sven Gottfried Markelius and presented to the UN as a gift from the country of Sweden. The complex’s 550-foot-tall Secretariat Building extends 39 stories and is noted for its construction of aluminum, glass, and marble, with north and south windowless facades constructed with 2,000 tons of Vermont marble. The complex also features the Dag Hammarskjöld Library, dedicated in 1961. More than one million visitors attend the complex’s visitor programming annually, including 45-60 minute guided tours of the facility, which have been offered since November of 1952. A variety of special exhibits are offered at the complex, including the UN Headquarters: A Workshop for Peace permanent exhibit. Temporary rotating exhibits have also been featured, including Maize: Our Food, Our Identity, Seventy Years of the International Law Commission, and Advancing Protection, Peace and Development in Afghanistan, Iraq and South Sudan. Fine international dining fare is offered at the Delegates Dining Room, including a three-course prix-fixe luncheon offered on weekday mornings and afternoons. The complex also offers the United Nations Bookshop, which carries a number of titles and digital resources connected to international historical and sociopolitical topics, and the United Nations Gift Centre, which sells United Nations and New York City-themed souvenirs and gifts. In addition to standard visitor tours, group tours are available for small groups and organizations, including a UN Kids Tour and curriculum-incorporated tours for elementary and secondary school groups. Groups may schedule briefings at the United Nations Headquarters on weekday mornings and afternoons, with all booking requests required at least six weeks in advance. A UN Visitor Centre app is also offered for iOS and Android, showcasing more than 65 works of art and important architectural elements throughout the complex.